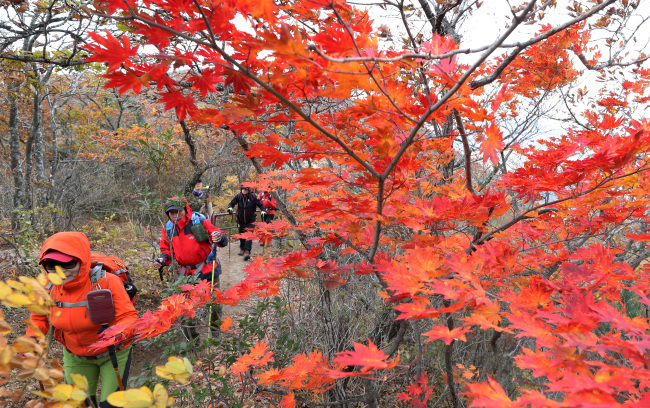 Every autumn, a chunk of the population rushes to the mountains to enjoy the breathtaking hues of the fall foliage, but a number of environmentally unfriendly habits that they bring along have been polluting South Korea’s ancient slopes for more than a decade. In recent years, eating meals packed in plastic containers and drinking bottles of rice wine at the summit has become a ritual for the hikers of South Korea. Though the mealtime rite may provide a relaxing experience for the hikers, it has also grown in controversy over the years with national parks struggling to deal with accumulated trash left behind. There are also those who brush their teeth in nearby streams after they finish their meals or enter restricted areas to enjoy “privacy,” which has made headlines in local news. A report released by the Korea Forestry Service in 2007 noted an increase in South Korea’s interest in hiking, but also shed light on the damage caused by “excessive use” of the mountains, citing that about 28 percent of the frequented trails were in urgent need of attention and repair. Considering recent government data show that about 32 million South Koreans go hiking more than once a year -- which has almost tripled from a decade ago -- and news reports continue to voice concerns over pollution in the mountains, vast damage is to be expected. “Though it is difficult to size the exact damage caused by increase in the number of hikers, there is bound to be damage in the trails that people frequently visit,” said Choi Yeun-ho, an expert at the state-run National Institute of Forest Science. “In the case of Bukhansan National Park, (situated within Seoul and believed to receive about 7 million visitors annually), the installation of facilities and sets of stairs to facilitate visitors have caused damage to the ecosystem. There needs to be an awareness and effort to limit such installations,” he added. An increasing number of hiking communities have also become an issue, with many of them marking the hiking routes by tying up ribbons of nondecaying materials such as nonwoven fabric on trees. It is one of the South Korean park ranger’s daily duties to remove the ribbons, and the Corean Alpine Club asks hikers to refrain from hanging the ribbons. The CAC is the largest mountaineers’ organization in South Korea. 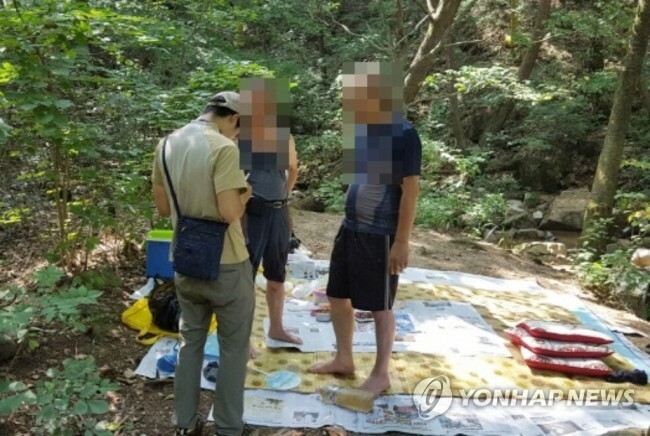 Civic groups and experts have been calling for awareness of hiking etiquette to prevent further damage to South Korean mountains. Last month, France decided to impose a daily cap of 214 climbers on its famous peaks of Mont Blanc next year, which is among several measures taken to handle overcrowding. Visitors and tourists with lack of respect for mountaineering etiquette along with concerns over safety have prompted officials to make such a decision. Choi said that preservation of the ecosystem and control of visitors are crucial in managing the parks, showing it is always dangerous to take nature’s gifts for granted.